Sacred Stream is happy to announce that it is sponsoring Robert A.F. Thurman’s Bay Area book tour for his new graphic novel, Man of Peace, which is a biography of His Holiness the 14th Dalai Lama. Dr. Thurman wrote this book in collaboration with William Meyers and Michael Burbank. This book is unique in that it captures all of the aspects of a very complex life in an accessible way. Dr. Thurman will be signing books at all of his Bay Area events, some of which include lectures and interviews on subjects related to His Holiness’ life. On September 9, Dr. Thurman will appear with Christian scholar, Matthew Fox at the Sacred Stream Center. Both scholars will offer insights drawn from their studies of great peacemakers, including His Holiness and Thomas Merton on what it is required to cultivate peace in difficult times. Matthew Fox will also be signing his newest book, A Way to God. On September 10, Dr. Thurman will give a book reading at Book Passage in Corte Madera, and on September 11, he will be speaking with Michael Krasny on KQED’s Forum radio program and, later in the day, he will appear at the Commonwealth Club in San Francisco – both programs will focus on the life of His Holiness. In the evening, he will be the anchor of a panel that promises to an insightful inquiry into Buddhist approaches to death and dying at UCSF. And on September 12, he will appear at Googleplex in Mountain View. 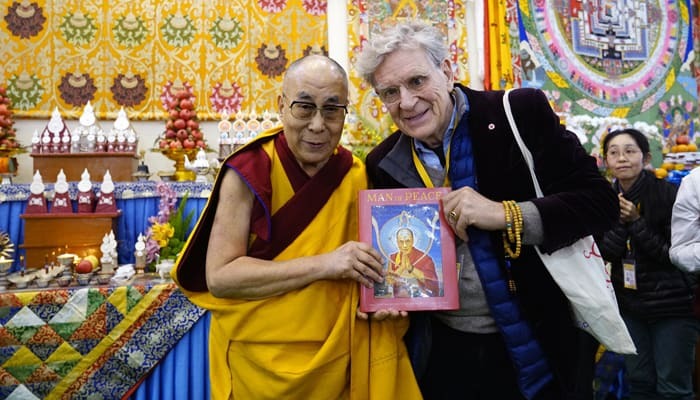 For more information on Robert Thurman visit bobthurman.com.